The TWU and supermarket giant Coles have signed two important Statements of Principles that will ensure safe and fair conditions for workers in the Coles supply chain and the on-demand economy. 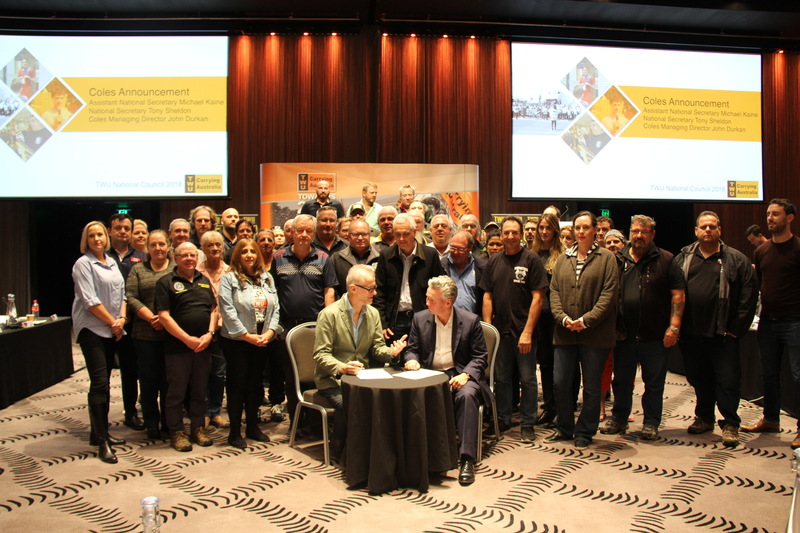 The first Statement, signed at the TWU National Council in Adelaide by Coles Managing Director John Durkan and TWU National Secretary Tony Sheldon, includes five principles to ensure safety and fairness for transport workers within the Coles supply chain that will underpin a Charter between the two organisations. Initiatives to ensure safety in the industry more broadly. A separate Statement of Principles about workers in the on-demand economy recognises that workers in the on-demand economy are involved in a rapidly changing workplace environment, but this doesn’t mean artificial terms for workers should limit their access to appropriate entitlements such as leave, proper payment, superannuation, safe working conditions and representation. TWU National Secretary Tony Sheldon said the Statements were a major positive for all transport workers – whether in traditional industries or the on-demand economy. “Coles and the TWU are saying through these principles that there is no higher priority than safety and fairness in the Coles supply chain and the on-demand economy,” he said. Coles Managing Director John Durkan said: “Our business, and the businesses of our thousands of Australian suppliers, rely on the skill and the efforts of the workers in our supply chain. As our business evolves to meet the constantly-changing needs of our customers, we are also increasingly engaged with the on-demand economy.